Hi All, having a '90's Manga comic flashback-saw Alita and now my OCD wants THIS!? Greetings, my first thread here ,figured since it looks like a balisong/butterfly-but huge.... this is the spot. I recently saw Alita Battle Angel and while they changed a lot they kept the main points of the movie and I am geeking out/loved it all, dont get me started on the CGI,motion capture.. not the thread for it-Ha! Anyone have info, who made,leads, have one they do not want?? PS-IF i want to post pics of my knives and such, is there a preferred program you folks use? I used to use photobucket but leary due to some issues with malware so I need to change programs.. SORRY off my topic. Back to reading in the various forums. Email Atropos knives out of Russia. 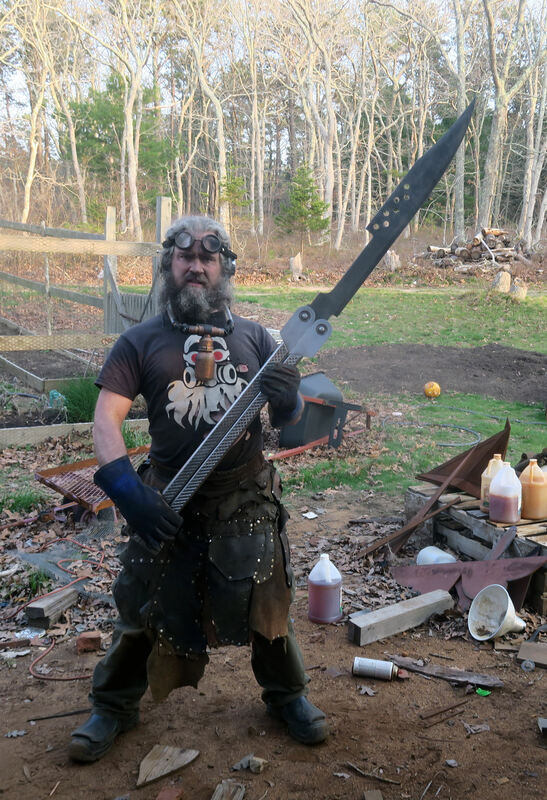 He does custom orders and has started making Bali swords, so I'm sure this project is something that is up his alley and one he'll consider taking on. The JerzeeDevil has a fine photo gallery. Click on Media and see what we got. Unfortunately, if you have hi-def pics, they're probably too large to fit. Often, you can resize them and they'll fit just fine. In cases when my pics are too large, I use imgur. Then, with a simple copy/paste operation, the pics show up here purty as ya pleeze! maybe you can pick up some ideas there. Regarding the pictures, I will look into what you said. I have google pics and I swear I see people link a gallery but I cannot seem to get any link to google pics to work, takes me to the login page.. I tried imgur but my phone did an update and now they dont like each other.... anyway ,keep trying. Yeah, his prices are pretty damn good, especially considering how much he works with his customers on options. He can most likely make it a full sword sized, keychain sized, or anything in between, just ask. Pretty much any material or extra feature I asked for, he was more than happy to include for like $20 ontop. apdallaround and skyblue like this. Wow, I saw that small one, that looks bitchin!!! I will email him and ask him for a quote to bump it up size wise... the trick for me here in kommiefornia is hopefully if I get it the same size as the ones that were sold it is not considered a 'knife' ,because butterflys are considered a felony.. oooo they are soo much more deadly... like having a pistol grip on a AR... please.. I am more likely to chop my own fingers, I just want one cause i am a geek for the comic/character... Hell i just spent big money on a pair of silver coins made for the movie, I should not have but... 1 of 75 in 1 version, 1 of 10 done in preaged silver.... so pretty damn rare..... I may hate myself in 6 months....but fukit!!! California has plenty of restrictions, like no autos over 2", no balistic knives, and no disguised knives, but as long as you arn't carrying it on your person and it stays at home, balisongs are perfectly legal to own. You also can't have it in the driver's or passengers compartment of a car, but you could lock it up in your trunk to take it to friends house or somthing. "The state of California has ruled that a Balisong knife is a switchblade because of how easily it can be opened. However, you can still buy Balisong knives that are over 2 inches if you do not carry it in the driver or passenger seat or on you. Simply put, if you buy Balisongs to collect and leave it at home, it is 100% OK."
Well i contacted the russian guy and was quoted 1200.00 to make it in the 37"oal version,1/2 down ,half upon shipping. Soooo maybe i can swing it for a christmas present for myself. I asked about tbe one in the instagram link..i can buy one,still 400+ , the fact that i cant use or carry it at all does damper it a bit but i will see in a month or 2. I am going to look up the law and see if the large one is still considered a 'knife' or a sword,pole arm. If so,cool. You may be able to make the case that it's a sword if it's carried in open sight, with the blade locked in the open position in a sheath. Folded, even in open sight, could be tricky, and could possibly even be considered a disguised weapon if not a balisong. I contacted him last night. The one on IG is $450 shipped to the USA.